For the rotten borough, see Milborne Port (UK Parliament constituency). Milborne Port is a village, electoral ward and civil parish in Somerset, England, east of Sherborne, and in the South Somerset district. It has a population of 2,802. The parish includes the hamlets of Milborne Wick, Kingsbury Regis and Stowell. The village is surrounded by green fields and countryside on the banks of the River Gascoigne, a tributary of the River Ivel or River Yeo. The village has a primary school, which occupies the site of the former infant school. The junior school was closed and all pupils and staff moved to the infant site. In 2006 a new three-classroom extension was opened. The nearby Laycock Railway Cutting is the best single exposure of the Bathonian ’Fuller's Earth Rock’ in South Somerset. Ammonites indicating the Morrisi and Subcontractus zones of the Middle Bathonian are frequent. Miller's Hill is a geological Site of Special Scientific Interest which is an important and historically famous locality for studies of Middle Jurassic (Bajocian) stratigraphy and palaeontology. Prehistoric features and finds have been located on the Iron Age hill fort on Barrow Hill, in the north of the parish. In the Saxon period Milborne Port was important as a mint town, between 997 and 1035. It is one of at least nineteen mint towns which were neither an Alfredian borough nor an eleventh-century shire town, but a minster site. The market was the most profitable in Somerset in 1086,and the town was eighth in the county tax collection in 1340. The "port" in the towns name signifies an important market town and was first recorded in 1249. The parish was part of the hundred of Horethorne. "MILBORN PORT, (Som.) bor. dist. from London 113 m. 7 f. [furlongs] situated on a branch of the river Parret, and may be considered as divided into three parts, viz. Milborn Port, Kingsbury Regis, and Milborn Wyke; however, the borough and Kingsbury lie in many places promiscuously intermixed together, both in the main town, and at Milborn Wyke; Milborn Wyke being as a village 1 m. N.... In Kingsbury is an annual court-baron held, wherein lord's rents are paid, presentments are made, and a constable, tythingman, and hayward, are appointed, for the year ensuing... Number of actual voters, 9, nominally 114. The church has a square tower, 6 bells, a clock, and chimes; one dissenting meeting-house, and upwards of 1000 inhabitants. The manufactures are dowlas, tick, white baize, linsey, stockings, and shoes. No market, but is supposed to have had one formerly. Fairs, 5 June, and 23 Oct., for cattle and toys. The post is despatched to Sherborne every day at 1 o'clock, and one arrives from thence at the same hour. Near it, on the left, is the seat of William Coles Medlecot, esq." Under the Reform Act 1832, the town lost its status as a Parliamentary constituency, due to the gerrymandering activities of both parties in preceding elections. The village was a thriving leather and leather glove manufacturing area. In 1826, The Earl of Ilchester presented a petition to Parliament for them, against the importation of leather. The last factory closed in 1970. Ven House with its orangery, entrance gateway, pavilions, terrace, stabling & other outbuildings was built in 1730 by Richard Grange and Decimus Burton. It is a grade I listed building. 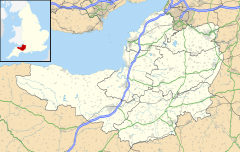 The village falls within the Non-metropolitan district of South Somerset, which was formed on 1 April 1974 under the Local Government Act 1972, having previously been part of Wincanton Rural District. The district council is responsible for local planning and building control, local roads, council housing, environmental health, markets and fairs, refuse collection and recycling, cemeteries and crematoria, leisure services, parks, and tourism. The cruciform church of Church of St John the Evangelist is of late Anglo-Saxon date and parts may well span the Norman conquest. The chancellor Regimbald (a survivor from Edward’s reign into William’s) rebuilt his Minster at Milborne Port in “a sumptuous hybrid style.” It would seem logical to assign the now-demolished nave to this period, since the surviving south doorway of the nave was incorporated into the 1860s rebuild and is perhaps of Saxo-Norman design. However, despite the Victorian nave (almost totally rebuilt 1867–69) and accompanying north aisle, there remains the pre-conquest central tower, part transepts and chancel. The south transept was heavily restored in 1843. The north transept was rebuilt along with the nave, so compared to pre-1867 almost half of the Anglo-Saxon church has now gone. The new nave is 28 feet (9 m) longer than the original it replaced. The old west front exhibited vestiges of triangular-headed arcading on either side of the inserted Perpendicular west window, and the lower part of the front was divided into compartments, by broad pilasters of plain square section. This was recorded by photography and the photo was published in 1893 by A. Reynolds, who was involved with building the new nave. The crossing (tower) is wider in plan than the nave, and markedly wider than the transepts or chancel. This is a distinctive Saxon trait, which may also be observed at nearby Sherborne Abbey (where significant traces of the Saxon rubble west wall may be seen, and which include a Saxon doorway in the north aisle). Inside, the four crossing arches with their jambs survive, although the east and west arches have been rebuilt in pointed 14th-century form; the south and north arches have been slightly deformed to elliptical shape due to the pressure of the masonry, perhaps by the addition of the top stage of the tower in Norman times. The chancel exhibits pilaster strip work, much disturbed and cut by Early English period windows, and has a close parallel at Bradford-on-Avon. The wall thickness of the chancel is 2 ft 8 in (0.81 m), which is a typical Anglo-Saxon dimension. The church, with its Anglo-Saxon features, is of major importance to our understanding of the larger minsters in pre-conquest England. The church has been designated by English Heritage as a Grade I listed building. ^ a b "Statistics for Wards, LSOAs and Parishes — SUMMARY Profiles" (Excel). Somerset Intelligence. Retrieved 4 January 2014. ^ Richardson, Miranda. "Milborne Port" (PDF). Somerset Urban Archaeological Survey. Somerset County Council. Archived from the original (PDF) on 4 March 2016. Retrieved 20 September 2014. ^ a b "Milborne Port". A History of the County of Somerset: Volume 7. British History Online. Retrieved 17 August 2008. ^ Wray, Lesley (2014). From Alfred's Port to Rotten Borough and Beyond (first ed.). UK: Stenlake Publishing Ltd. pp. 15, 22. ISBN 9781840336511. ^ Historic England. "Early Medieval and Medieval urban remains, Milborne Port (1017393)". National Heritage List for England. Retrieved 16 November 2014. ^ "Somerset Hundreds". GENUKI. Retrieved 9 October 2011. ^ Oulton, W. C. (1805) The Traveller's Guide; or, English Itinerary, Vol II, pp 272-273. Ivy-Lane, London: James Cundee. ^ "PARLIAMENTARY INTELLIGENCE. - HOUSE OF LORDS, FRIDAY, FEBRUARY 17, 1826. - The Sydney Gazette and New South Wales Advertiser (NSW : 1803 - 1842) - 29 Jul 1826". ^ Historic England. "Ven House, Milborne Port (261884)". Images of England. Retrieved 19 January 2009. ^ Historic England. "Corridor linking Ven House and the Orangery, Milborne Port (261887)". Images of England. Retrieved 19 January 2009. ^ Historic England. "Main entrance gateway, 35 metres North-West of Ven House, Milborne Port (261890)". Images of England. Retrieved 19 January 2009. ^ Historic England. "North-East Pavilion and balustraded brick wall, Ven House, Milborne Port (261885)". Images of England. Retrieved 19 January 2009. ^ Historic England. "North-West Pavilion and balustraded link wall, Ven House, Milborne Port (261886)". Images of England. Retrieved 19 January 2009. ^ Historic England. "Stabling and other outbuildings, attached to East side of Ven House, Milborne Port (261889)". Images of England. Retrieved 19 January 2009. ^ Historic England. "Terrace along South Garden front, Ven House, Milborne Port (261891)". Images of England. Retrieved 19 January 2009. ^ Historic England. "The Orangery, attached to the South West corner of Ven House, Milborne Port (261888)". Images of England. Retrieved 19 January 2009. ^ "Wincanton RD". A vision of Britain Through Time. University of Portsmouth. Retrieved 4 January 2014. ^ Blair, John (2005). The Church in Anglo-Saxon Society. Oxford University Press. ISBN 978-0-19-822695-6. ^ Taylor, H.M.; Taylor, Joan (1965). Anglo-Saxon Architecture. 1. ^ Historic England. "Church of St John the Evangelist (261841)". Images of England. Retrieved 17 August 2008. Wikimedia Commons has media related to Milborne Port. This page was last edited on 29 August 2018, at 23:47 (UTC).